We’d love your help. Let us know what’s wrong with this preview of The Journals of Father Alexander Schmemann, 1973-1983 by Alexander Schmemann. 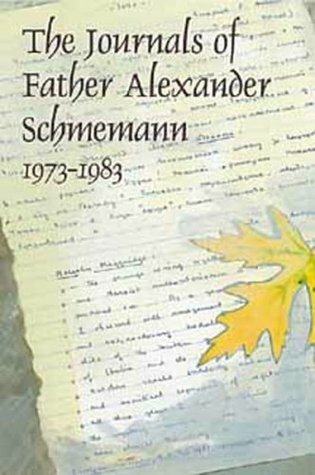 These journals offer insight into the quiet, intimate side of Father Alexander Schmemann. They witness to the magnitude of his heart and humanity. Translated and edited by his wife, the abridged journals reveal his recollections and experiences, and record much of his formative creative thought on all manner of subjects between January 1973 and June 1983. To ask other readers questions about The Journals of Father Alexander Schmemann, 1973-1983, please sign up. I didn't think there could be such s thing as too much Schmemann but, no, this is entirely too much. For every wonderful insight, there's a buildup of his personal frustrations and negative tendencies that feel very much not-for-our-eyes. I'm sure someone, somewhere has benefitted from his testament of faith, but I personally found myself discouraged by this side of the man, a part divorced from a whole and therefore an incomplete portrait of the priest and his life. Так тяжело что-то написать про эту замечательную книгу. Нигде и никогда я не встречал человека столь тонко чувствующего мир, как отец Александр. На ум приходит только Чехов, которого так любил Александр Шмеман. Эти дневники стали для меня неотъемлемым дополнением к Евангелие. Какая тишина, какой свет в этом человеке. Невольно задаешься вопросом: жил ли ты хоть секунду с тем же переживанием момента, какое описывает отец Александр. Действительно замирание времени, всеблагость самой жизни. Не даром Так тяжело что-то написать про эту замечательную книгу. Нигде и никогда я не встречал человека столь тонко чувствующего мир, как отец Александр. На ум приходит только Чехов, которого так любил Александр Шмеман. Эти дневники стали для меня неотъемлемым дополнением к Евангелие. Какая тишина, какой свет в этом человеке. Невольно задаешься вопросом: жил ли ты хоть секунду с тем же переживанием момента, какое описывает отец Александр. Действительно замирание времени, всеблагость самой жизни. Не даром его называют апостолом радости. Я не самый показательный христианин, не мне судить Церковь, поэтому я не буду браться за доказательство "правильности" или "неправильности" какого-то ощущения Христа, но это именно то христианство, которое я хочу слышать. "Радуйтесь и паки реку радуйтесь..." - самая частая евангелическая цитата в дневниках отца Александра. Это радующееся христианство, пропитанное тихим счастьем за то, что бытие все таки есть, хотя его вполне могло не быть. Без бесконечного копания в своем и чужом грязном белье, самоуничижения, доходящего порой до самоотрицания, не религия страха, но религия бесконечной любви и счастья. Во всем отец Александр ищет Свет, а не тьму, хотя мы и возлюбили тьму больше. Fr Schmemann is a Mystic of real life...captivated by the Light of the world and witness to the Triune God's prismatic, Pentecostal fullness; God's plan for a new heaven and a new earth. Father Schmemann takes his cue from this mystic vision and from this perspective always looks to the end of all things, but the end as it transfigures the present and makes the presence of eternity present to us personally. The end, as in the end of a long journey home. Fr Alexander ha Enchantingly, simply Joyful! Fr Alexander has a profoundly deep, but simple awareness of 'the one thing needed' and 'the treasure of the heart'. By his clear vision, this modern Church Father is able to speak with the authority of and for the Church. He is an apostle, from the ageless path of eternity and speaks beyond the crude categories of 'the world', as a friend of Christ on pilgrimage. It is in this properly theandric context that Schmemann gains the right, nay, duty to scold the insane idolatry inside and outside the Church. Any criticism of grumpiness are a 'holier than thou' interpretation of Fr Schmemann should be assuaged by these personal journals because it is clear that this is a humble man, who knew dull well his own limitations, without focusing excessively on these same limitations as too many do. Moreover, he corrects a lot of his own crude generalisations from other work. This was particularly welcome in relation to the 'east' and 'West' because that dichotomy undermined his central insights. Today, we have a chance to correct this in different areas to see the Church in it's true character- particularly before the schism. His meditations are on the Light of God as he reveals himself and Father S is consistently humble, receptive to this gift throughout his life. Common targets of his Prophetic scorn are a 'fussiness' in Church and 'senselessness' outside the Church. Both of these are frightfully necessary and his analysis is justified, clear and charitable throughout, on these and other concerns. Fr. Schmemann’s famous formula for a modern-day monasticism is great—and almost worth the price of admission. Unfortunately, there’s a lot of uncomfortably intimate grumbling and grousing to slog through. Reading another’s letters or journals, while sometimes ethically questionable, is almost always entertaining and more often than not, it provides illustrations of how literature and theology ought to be done. Fr Schmemann is no exception. These journals span ten years and reflect his thoughts on church, politics, and culture. What makes them refreshing is that he can offer America an outsider’s perspective on a range of topics. One can summarize the Journals in a few words: two No’s and a Yes—no Reading another’s letters or journals, while sometimes ethically questionable, is almost always entertaining and more often than not, it provides illustrations of how literature and theology ought to be done. Fr Schmemann is no exception. These journals span ten years and reflect his thoughts on church, politics, and culture. What makes them refreshing is that he can offer America an outsider’s perspective on a range of topics. One can summarize the Journals in a few words: two No’s and a Yes—no to secularism, no to “spirituality” and yes to the Kingdom of God. The book is a gem. Some pages are beyond beautiful. Not only does Schmemann offer analyses of church and culture, but he gives penetrating insight into the human condition. There are moments, however, when Schmemann is not quite consistent, especially in his critique of Alexandr Solzhenitsyn. While A.S. definitely went overboard, one cannot help prefer A.S.’s vision of Soborpravnist over against the liberal democracy of Carter-Reagan America. That aside, almost every page is a feast. I snatched this book from a sale table at a Catholic bookstore, and even though I was very happy with my find, it wasn't until months later that I actually read it. Meaning that this treasure sat, unappreciated, on my bookshelf for close to a year. Silly me! Once I opened it, I could hardly bear to put it down. I found Fr. Schmemann's reflections remarkably insightful. You know those little Post-It bookmarks? The skinny ones that come in packs of four colors? I used an entire "batch" of those ma I snatched this book from a sale table at a Catholic bookstore, and even though I was very happy with my find, it wasn't until months later that I actually read it. Meaning that this treasure sat, unappreciated, on my bookshelf for close to a year. Silly me! Once I opened it, I could hardly bear to put it down. I found Fr. Schmemann's reflections remarkably insightful. You know those little Post-It bookmarks? The skinny ones that come in packs of four colors? I used an entire "batch" of those markers in this one book: 200 especially noteworthy passages... I intend to take notes on all 200, and to incorporate Schmemann's thought into presentations that I am preparing for a retreat program. One thing that struck me overall was Schmemann's attentiveness to the natural world: the weather, the sky, the autumn leaves, the new spring leaves. And his abiding spirit of joy. At first this reminded me of another journaling soul: Etty Hillesum. But on reflecting, it seemed that both of these beautiful spirits were kindred to St Francis of Assisi. Schmemann seems to have been a natural mystic, and the wonderful experiences in his upbringing and education combined with that mystic bent to produce a spiritual writer and liturgical theologian who can speak to the mystic heart of each person. A fascinating read that has been by my bedside for the past six months or so. Honest near-daily journal entries from the last ten years of Schmemann's life open up a struggling-questioning-yearning-yet-responsible Orthodox way of being. A prolific & popular Eastern Orthodox liturgical theologian, Schmemann is more famous for his work For The Life of the World or his collected sermons, Celebration of Faith. He confesses to not belonging, not understanding his call, and yet is continually turned A fascinating read that has been by my bedside for the past six months or so. Honest near-daily journal entries from the last ten years of Schmemann's life open up a struggling-questioning-yearning-yet-responsible Orthodox way of being. An honest intimate look at a revered Father's struggle with the church. Thought provoking, riveting and beautifully written. A timely book for this one who is disenchanted with the church of his past. I wish I could give a book 6 out of 5 stars. Protopresbyter Alexander Schmemann was a prominent Eastern Orthodox theologian and priest of the Orthodox Church in America.